This recipe was inspired by what is now a long-forgotten western movie, There was a cantina scene with a large jar of pickled eggs on the bar. They looked so good when the actors fished them out of the jar and I wanted to have pickled eggs too. With a little trial-and-error, I developed this recipe. Hard boil eggs; place eggs in cold water, bring to a boil, reduce heat, cover and simmer for 5 minutes. Let stand 10 minutes, then cover with cold water. After eggs are cold, peel. Place in big, tall glass jar or similar container. A 20-ounce wide-mouth canning jar makes a good jar for 6 eggs. Combine vinegar, water, sugar, salt, cloves and bay leaf in a non-reactive pot. Bring to a boil; reduce heat and simmer for 5 minutes. Pour hot vinegar mixture over eggs, covering all of the eggs. Place onions on top of the eggs. Cover tightly and place in refrigerator to age for several days. Yields 12 pickled eggs. These eggs are wonderful with a cold roast beef sandwich or on deli trays. Variations: The addition of 1/2 to 3/4 of a cup of your home-canned beet juice will give your pickled eggs a reddish-purple beet color with little change in the taste of the eggs. 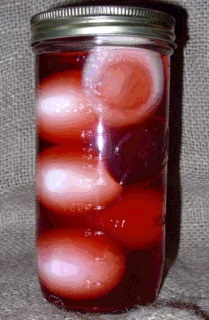 The color penetrates about 1/8 of an inch into the white of the eggs. Makes a lovely attention grabber on your deli platter.